Xzax is an SSB4 Fox player from Philadelphia, Pennsylvania, who currently resides in Hayward, California, considered one of the best Fox players in the United States. Xzax was formerly ranked 2nd on the NorCal Smash 4 Power Rankings and 8th on the SoCal Smash 4 Power Rankings, while being currently ranked 92nd on the Panda Global Rankings 100. In SSBB, Xzax was a Falco player, considered one of the best Falco players in the world. He was formerly ranked 8th on the Tristate Brawl Power Rankings, and 29th on the 2014 SSBBRank. 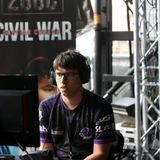 On November 16th, 2016, Xzax was signed by Team RivaL. Nearly a year later, on September 4th, 2017, Team RivaL would part ways with Xzax, along with fellow smasher Mr.E. On February 22nd, 2018, Xzax was sponsored by the Milwaukee Wolves. On April 17th, 2018, Xzax announced that he would be semi-retiring from competing in order to focus more on his personal life. Revival of Kin 8 November 4th, 2016 1st ? ? Revival of Kin 9 November 11th, 2016 1st ? ? Revival of Kin 21 February 10th, 2017 1st ? ? Xzax is cousins with Vex Kasrani. ↑ Team RivaL signs Xzax. This page was last edited on April 16, 2019, at 21:02.